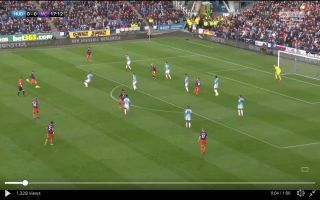 In the 17th minute of today’s Premier League encounter between Manchester City and Huddersfield the Citizens took the lead after a bizarre deflection. Danilo’s long-range effort was deflected into the back of the net after Huddersfield defender Christopher Schindler attempted to block the strike but his header was directed straight into the ground and it bounced into the bottom corner. The goal was City’s 100th across all competitions this season, Guardiola’s side are one of the most ferocious attacking sides in the world. Pep Guardiola’s side will be four points behind Liverpool with a victory against the Terriers this afternoon, Jurgen Klopp’s men are yet to slip up this season and City are the only team that have the quality to beat the Reds to the title.